Sainik School, Goalpara has advertised in THE Deccan Chronical newspaper for recruitment of Teachers jobs vacancies. Interested and eligible job aspirants are requested to attend walk-in on 16/04/2018.Check out further more details below. 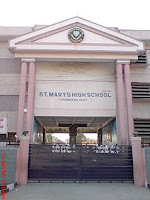 Name of the School: Hyderabad Archdiocese Educational Society(HAES), Secunderabad. About School: St. Mary's High School is one of the oldest schools in Secunderabad. It was established in 1885 and is managed by the Hyderabad Archdiocese Educational Society (HAES). (a) Degree with B.Ed in their respective methodology. (i) HAES invites application from the qualified and experienced teachers. How to Apply: Interested and eligible candidates are requested to walk-in interview and demo with lesson plan and Resume. 16-04-2018 from 9.30 a.m to 1p.m at St..Mary's High School,St.Francis St,Secunderabad.500025.